Sickle cell anemia is basically an inborn blood disorder which is caused due to abnormal hemoglobin. The abnormal hemoglobin causes sickle shaped or distorted red blood cells that tend to be delicate and are prone to breakage. Resultant condition caused due to the breakage of red blood cells is called sickle cell anemia. Cure for sickle cell anaemia is designed as per individual presentation. Common symptoms of sickle cell anemia include damage of important organs such as the nervous system, kidney and brain; heart and lung injury; aseptic necrosis, swelling and joint pain and eye damage. Ayurvedic treatment for sickle cell anemia is focused on treating the main cause of the disease and trying to prevent serious complications. 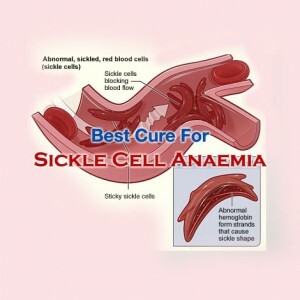 Some of the most effective Ayurvedic medicines used for treating sickle cell anemia include Musta, Guduchi, Amalaki, Heerak Bhasma, Suvarna Malini Vasant and Laxadi Guggulu. The only and the most effective cure for Sickle Cell Anaemia is bone marrow transplantation. However, getting hold of a donor is quite difficult apart from the serious risks which are associated with the procedure. It might also result in the death of the patient. Pain reliving medicines and antibiotics are given to the patient for reducing pain and even for preventing further complications. Hydroxyurea is an effective medicine which helps in reducing pain and it works by stimulating fetal hemoglobin production. Blood transfusion is another effective method used for treating sickle cell anemia. However, it is to be noted that multiple and continuous blood transfusions might result in major health problems due to the high iron content of blood. Treating sickle cell anemia at home includes following the steps that can help in controlling pain and in preventing complications causes due to the disease. Patients should look out for the ways of coping with worries and stress and of managing pain.